We took a family vacation to the poconos mountain in Pennsylvania and we had an amazing time in the resort, the staff was great and made us feel right at home!! We enjoyed the indoor pool and the hit tub. Bookvip, you helped us save over $2,000.00! Paid for a resort ressrot named Cabo Palace Beach Resort with location listed in Cabo San Lucas. Then VIP Booking phone rep did a bait and switch on me while on the phone to a resort in San Jose Del Cabo. VIP booking made me sign off over phone and would not let me see resort until after taking my money. VIP never sent link and I found out about the location by calling custoemr service back and asking why the resort name had changed? they were rude and said that was the resort I booked. no refunds. They refused to refund me and had to call credit card to report scam. VIP Booking is a high pressure scam. Bookvip - This is the most memorable trip we’ve ever had! We’re on our last day at the beautiful Grand Sirenis. The kids have been swimming all day. We had such a great concierge that we bought a membership. We will be back many times. 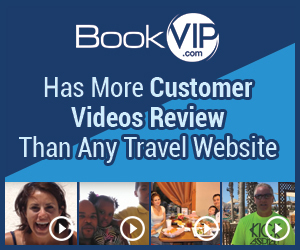 We saved hundreds of dollars booking through Bookvip.com! We just spent a wonderful anniversary vacation at the Tahiti Village thanks to Bookvip.com. This is a wonderful hotel. This is a once in a lifetime trip. Thanks BookVIP! We saved over $5,000.00 booking through Bookvip. The resort is amazing, the people are amazing, the beaches are gorgeous. We never could have afforded this without Bookvip. If you want to go somewhere, make sure you contact Bookvip.com. They will fix you up.